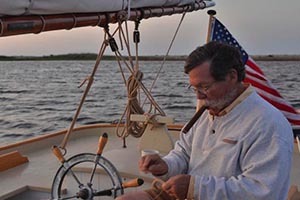 Growing up with Beetle Cats in the 1950s out on Onset Harbor, and a life-long love of traditional wooden sailing craft, made the opportunity to own and work with these timeless, classic boats perfect for Bill Womack. In addition to childhood experiences and personal interests, Bill also served in the United States Navy with Seabee Team 1110/1114 in South Vietnam from 1966 to 1970. 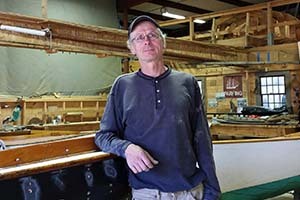 A degree in Civil Engineering and over 40 years working in heavy highway construction help to prepare him for the important task of preserving the art of traditional Plank-On-Frame wood boat construction at the Beetle Boat Shop. Michelle’s first experience on a wood boat was at 2 months old on Lake George, NY in a classic Lyman. Growing up she spent time on the water fishing on lakes and streams in the Catkills. Michelle graduated with a degree in civil engineering, served as an officer in the Army for 4 years, before beginning work as an engineer/quality control manager. When Bill Womack bought the company in 2003, she was self-employed and brought on board to help with the accounting work. It was then that Michelle learned to sail in a Beetle Cat, and moved to the southcoast where she enjoys sailing, inline skating, triathlons, and crossfit. With a heavy construction background from Perini Construction and McCourt Construction in Boston, MA, Jonathan also has a BA in Building Construction Technology from Wentworth Institute of Technology. He grew up summering on Onset Island doing a lot of sailing and boating as a kid on wooden skiffs. He lives with his wife Teri and sons Charlie and Henry, whom he enjoys boating with in his personal time. With an Undergraduate in Historic Preservation from Roger Williams University and a year at the International Yacht Restoration School (IYRS), Seth has always loved working with wood, but felt that house restoration wasn’t challenging enough for him. 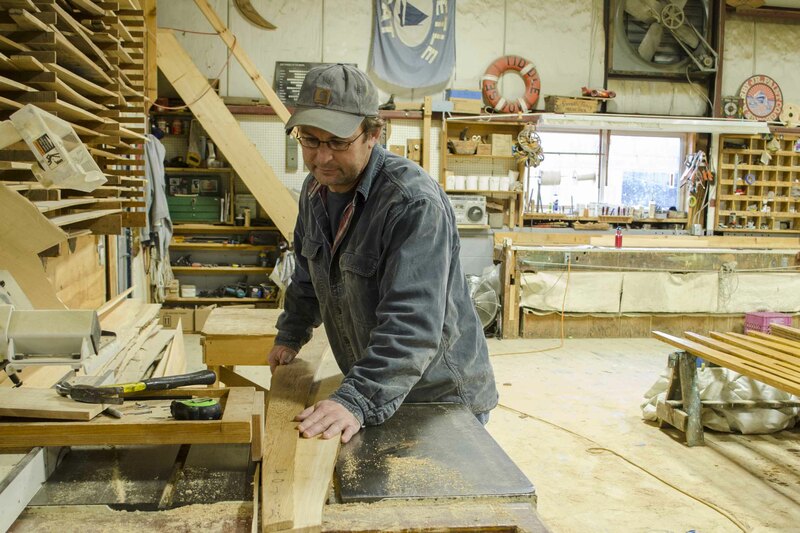 Seth comes to the Beetle Boat Shop from Pleasant Bay Boat & Spar, where he worked honing his skills for four years. Prior to completing his education at IYRS, he also worked all around the Philadelphia area doing restoration work. He lives with his wife Megan and his hobbies include golfing and constantly improving his house. Growing up along the Hudson River, Seth’s first sailing results were frustrating, but he stuck with it and now owns the first Beetle Cat that he ever worked on. Marc earned his degree in Physical Education from Bridgewater State University. After graduating college, he was a personal trainer for four years working for both private individuals as well as for a Boston-based sports facility. He is an avid cyclist and runner, having run numerous marathons across the country. 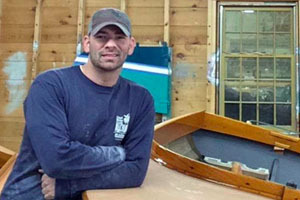 Before joining the Beetle Boat Shop in 2006, Marc gained ten years of experience painting residential and commercial properties. He spent summers on Cape Cod as a kid, and always enjoyed being around the water. He and his wife, Sharon, love spending time on the Cape and were married at Mass Maritime Academy in Buzzards Bay in 2013. 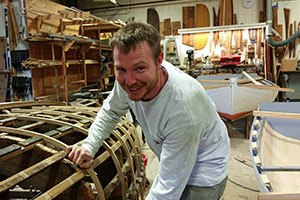 A graduate of RISD in 2002, Manny’s experience comes from working with Gannon & Benjamin and Wooden Boatworks. 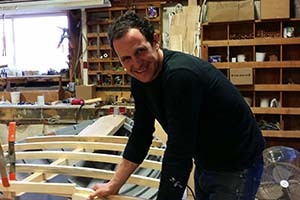 He sees boatbuilding as a connection to the past, enjoys working with his hands and has a real love for adventure, all of which attracted him to wood boats. When he was young, he sailed to the Azores and Cape Verde, and cruised around the Islands and New England. His personal hobbies include sailing and surfing. Manny started building boats after school, which led him here to the Beetle Boat Shop. Jeremy joins Beetle Inc. after working many years in fisheries science. He’s enjoyed messing about in boats since he was a boy chasing fish near Padanaram. He now delights in rowing with a sliding seat, and sailing around Cape Cod and the Islands with his wife, Beth. 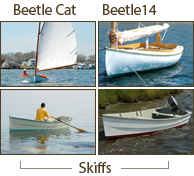 Denise grew up on the waters of southern Maine, and fondly remembers puttering around with her father in his wood dory. 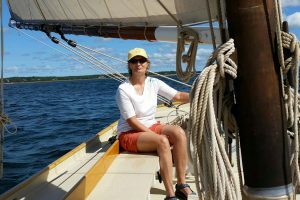 She attended UNH, Landscape Design Institute, and Wooden Boat Building School. 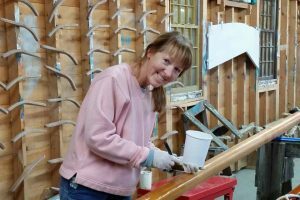 She has worked for over 15 years on maintaining wood boats in a variety of boat yards in Maine and Massachusetts. She also continues to work in land surveying and landscape design. She enjoys gardening and relaxing at home with a good book and the company of her husband David, 2 corgi’s and 2 cats. Growing up as a young pup, Salty grew up summering on Onset Island. She enjoys rides in the Onset Island Skiff and loves swimming in the ocean. 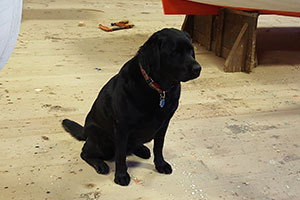 A four year-old Black Labrador, Salty takes her job seriously, and loves to greet everyone as they come into the shop.